I started something called the cult of the Audio Buddy. The home recording world (OK, the cheap home recording world) needed a couple of channels of useable mic preamp at a budget price. 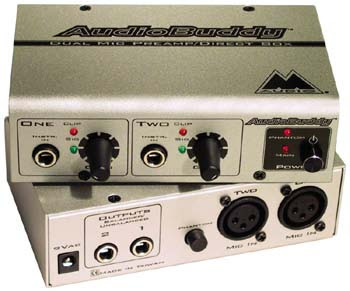 Despite M-Audio's attempts to label the Audio Buddy as a computer mic preamp, it provides OK and mostly useable sound regardless of whether you record to tape, all-in-one DAW box, or computer. I started the cult by making recordings with the Audio Buddy and posting recordings on some of the audio forums. The usual response: "It sounds surprisingly good." The masses heard the recordings and side-by-side tests. Some found themselves so torn that they went out and put down the extremely low cost of admission to my cult. Could it be that someone could make a useable mic preamp with two channels for under $100? For the low street price, you get 41.4v of phantom power, two channels of mic pre or DI, two 1/4 inch outs (unbalanced and balanced), worthless clip and signal LEDs, and relatively clean gain with little noise. Oh yeah, it also does not sound like absolute crap. The Audio Buddy seems quiet. I detect no noise until gain reaches near maximum. The bad: Those clip and signal LEDs really are cruddy. But, they aren't reliable on most gear at this price either. You'll have to use a Velcro rack solution if you'll want to stick the Audio Buddy in a rack. But, what do you expect? The Audio Buddy also does OK as a DI. No, it's not one of the best DIs. It performs equally on bass, electric guitar and on acoustic pickup solutions such as those by Fishman. On bass, it puts down the tone. But, it does not accurately and quickly track the playing of certain bassists and it does not provide a flat frequency response. So, you'll need to make playing adjustments and will likely need to use a compressor or limiter. The sound on DI is surprisingly good -- now I'm saying it too. Yes, it's low rent. Yes, it's cheap. Did I say it's surprisingly good? The sound quality of the Audio Buddy is grainy. As a mic preamp, it pairs to good use with a number of lower cost condenser mics. However, I have not liked it with the Oktava MK219. And, I don't like the Audio Buddy with any dynamic mics. However, my personal opinion is that you need a great mic pre to get a great sound out of a dynamic mic. The Audio Buddy can produce a sufficient quality vocal sound to make demo quality recordings. However, you must supply the skills. I suggest getting an Audio Buddy as a first mic preamp. It's a good unit to learn how to push a mic preamp to the edge to get the best possible sound. If you reach that point, then you'll be ready to upgrade to an FMR RNP or an even better mic preamp. People ask if the Audio Buddy is a step up from the Mackie and Behringer analog mixers. I think the Audio Buddy is a little better than the mic preamps in either the Mackie or Behringer, which I think sound the same, but I don't think it's enough to be an upgrade by any stretch. The Bottom Line: It's a piece of budget gear for the home recordist who can't afford something better. It's a simple, two-channel mic preamp and DI.